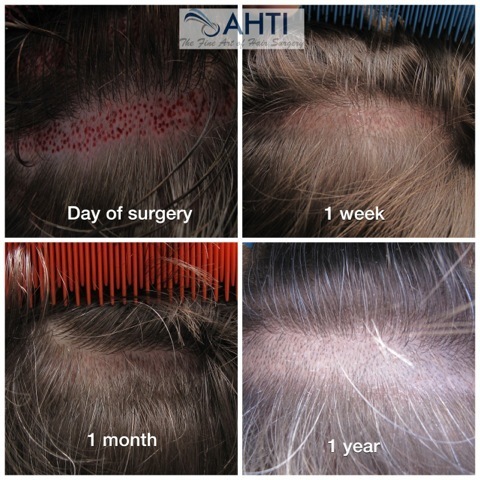 At AHTI, a hair transplant is not just about replacing lost hair or quoting the number of graft. We work with you to achieve the desired aesthetic appearance and help you regain your confidence. We also plan for the future by preventing further hair loss and making sure your transplant compliments your appearance with time. With years of research and experience, our chief surgeon, Dr. Johnathan Chan is a true leader in the field of hair transplants so you can be sure that you will get the highest standard of hair surgery you won’t find anywhere else. Dr Chan is one of the first hair surgeon to specialise in hairline and eyebrow transplants. He has developed a unique method of Ultra Fine Follicular Unit Extraction (FUE) for successful hair regrowth. Discover the difference at AHTI and call us on 02 9415 4126 today! This is what typical hair re-growth looks like over the first 12 months. To see more results, please visit our Gallery. To regrow your hair naturally, Dr Chan manually uses a small extractor tool* (0.6-0.7 mm) to transplant hair follicles (hair cells) from your scalp and/or body into the parts of your scalp or face where your natural hair no longer grows. Since hair follicles are “pockets” of delicate hair cells, the maximal survival rate is guaranteed when handled with utmost care. In our opinion, extraction using machine will potentially increase the unnecessary damage to the cells resulting in lower survival. ALL delicate surgeries are still best performed by skilled surgeon’s hands, NOT machine. Fastest healing and invisible scarring. Maximal survival rate with results guaranteed possible with use of specialised implanters and combining with PRP/laser therapy. Dr Chan achieves the consistent results by extracting and implanting every hair graft personally! In AHTI, we consistently get above 95% of the transplanted hairs surviving and growing hair after 12 to 18 months from the surgery. With suitable candidates, Dr Chan will write you a guarantee declaring that if less than 95% of the hairs survived 18 months after your treatment, he will give you FREE FUE treatments to fill in any gaps. For a detailed discussion on whether FUE hair transplantation is right for you, please book a confidential consultation at our clinic or an internet consultation (interstate or overseas) between you and Dr. Chan. Dr Chan will address all your concerns and tailor a solution that is most suitable to your situation and goals. For leading hair loss treatments, turn to the experts at AHTI. Contact us on 02 9415 4126 today. In April 2011, FDA approved a robotic hair follicle harvesting device, the ARTAS system, for male pattern baldness. It is approved for use only in people with brown or black straight hair, as the studies that led to this did not include people with blonde or curly hair. The device is used as a tool for harvesting hair follicles in the FUE (follicular unit extraction) method of hair transplantation, as opposed to the traditional FUT (follicular unit transplant), where a strip of scalp skin is cut. 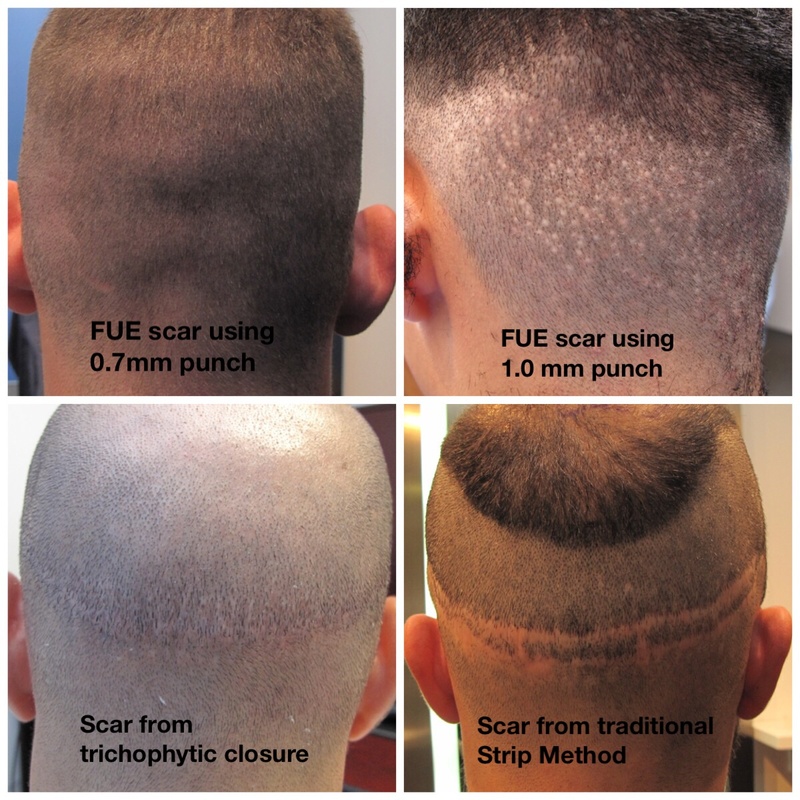 The FUE technique extracts each hair follicle and avoids a linear scalp scar that may be a problem for patients who want to wear their hair very short. In the robotic procedure, the patient is strapped face down to the operating chair to minimise movement. The robot then uses a double punch to harvest the hair follicles as located by its computer imaging. After these punches are made, the doctor or technician then removes these follicular units manually. The patient is then repositioned, and the robot works on another area. The robot is used mainly for the harvesting process. These follicular unit grafts are now ready for the next phase of the transplant procedure, implantation, which is performed in the usual way. Tools that aid a hair surgeon in harvesting hair follicles are not new; the hand-held motorised rotary devices are often compared to this robot as having a higher transection (damage) rate. This is because the motorised tools vibrates and interfere the surgeons touch sensation. This also explains why some highly skilled and experienced FUE hair surgeons do not prefer to use motorised tools. It is important to differentiate the different FUE harvesting methods, and the tools used. Some highly skilled FUE hair transplant specialists prefer to harvest hair follicles by feel. Each hair follicle comes out at a different angle and direction. In highly skilled and experienced hands, the transection rate is minimal even with a punch size as small as 0.7mm. As the angulation, direction and depth of the hair follicle can change in a 3-dimensional plane quite abruptly; it is not possible to predict where the hair travels from looking at the exiting hair’s direction on the scalp’s surface. In skilled hands, these minute differences can be felt, and direction of the punch can be manipulated skilfully to glide next to the hair shaft into each hair follicle. The transection rate is greatly reduced and a smaller sized punch can be used effectively. This is a highly refined skill that requires a lot of patience and concentration, thus the transection rate can vary greatly amongst specialist. It is a common concern that the ARTAS system uses large sized punches, increasing the risk of unsightly scars. The reason for the larger punch sizes is to allow for the robot’s greater margin of error. The punch size varies with different clinics. The smallest size used in most clinics in America is 1.00mm. This will vary with patient’s own characteristics. The robotic harvesting system is still relatively new, and hopefully improvements will be made in the future. For now, the robot has the advantages of saving doctors time and decreasing the doctor’s fatigue. It has the disadvantages of using large punches risking visible scars; making hundred of punches automatically in a small area before any damage is realised by the surgeon; limited harvest sites ; and limited to brown or black straight hair. Due to these limitations, some surgeons are still reluctant to risk the possible inconsistent results and irreversible damage to hair follicles. Therefore, it is reasonably to say that robots have not replaced the surgeon’s experienced tactile skills in hair follicle harvesting. However, robotic techniques may improve in the future to rectify our concerns and may one day be generally accepted as a reliable hair follicle harvesting tool in FUE hair transplantation. *Our clinic strictly follows The National Infection Control Guidelines of NHMRC of Australia. All of our sharp instruments are properly disposed after each patient use and our steriliser is regularly validated and calibrated by HTC Medical Pty Ltd.